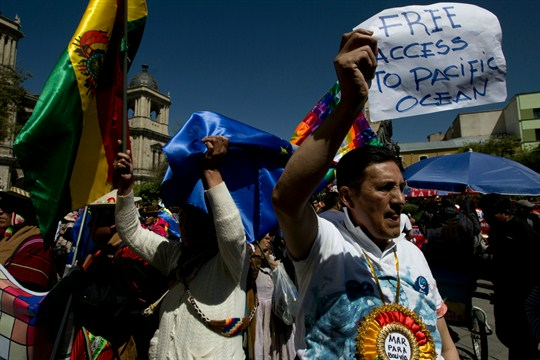 A man shouts in support of a favorable ruling from the United Nations’ highest court, in La Paz, Bolivia, Oct. 1, 2018 (AP photo by Juan Karita). On Oct. 1, the International Court of Justice announced its long-anticipated verdict in a case brought by landlocked Bolivia, which argued that neighboring Chile was obliged to negotiate Bolivia’s territorial access to the Pacific Ocean. The ICJ ruled in Chile’s favor, dealing a major blow to Bolivian hopes for a route to the Pacific Ocean more than a century after its current boundaries were decided. Bolivian President Evo Morales, who rose to prominence in part due to his outspokenness on this issue, said after the ruling that “Bolivia will never give up.” In an interview with WPR, Christopher Sabatini, a professor at Columbia University and a non-resident fellow at Rice University’s Baker Institute who specializes in Latin America, discusses the ICJ ruling and its impact on Chile-Bolivia relations.